Members, a great way you can help welcome our many guests for Easter is to attend our Saturday night Easter service. We need at least 1000 people to attend Saturday service in order to make the room needed for our guests on Sunday morning. Thank you for helping to welcome our community. If you are unable to attend services this week, plan to be a part of Holy Week and Easter via live streaming. 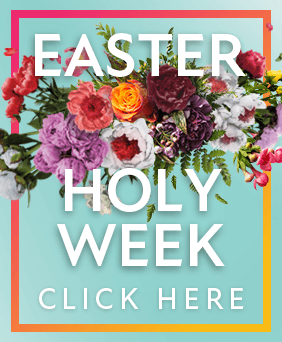 All Holy Week and Easter services, except Easter sunrise service, will be available via live streaming on the app or website. Listen in as our teaching team and guests discuss Jesus. His character, purpose and heart for His people come alive as they walk through the events of Holy Week. Experience your Savior in a new way through these discussions. Podcast episodes are now released with a new player to make listening easier. Invite your friends to Investigative Forum (IF)! This five-week forum is a great opportunity for you to partner with Randy Pope to reach out and invite someone who may be seeking to understand the claims of Christianity. No registration is required. Join us at the Perimeter lake for a Perimeter family fishing day! Poles, worms, and fish are provided. Come cast and catch with us. We will be fishing from 8:00 AM until Noon. Come anytime in between. Hope to see you there! Registration for Rush is open until May 15. Rush is a four-day Christ-centered student-led conference July 8 - 11 that your teen won't want to miss! Did you miss the "Week at a Glance" video announcements this week? The video is available online so you can see it any time! Randy and Carol Pope invite you to attend this inspirational evening where you can check out Perimeter Church. 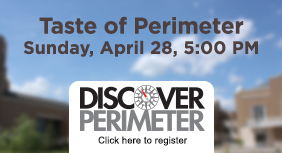 At this covered dish dinner, hear the story of Perimeter and sample a few of our ministries. Bring your favorite main dish, and a salad or a vegetable. The Membership Class is the first step in the membership process and provides a foundation for what we believe, what we value, and why we exist, as well as what it means to be a Christian, a member of a church, and why that matters. Register to attend our next class. Perimeter is a big place, but don't let its size fool you. We have many simple and easy ways to get connected and start developing new friendships. We are a church that is built on personal relationships that span over many generations. We hope you will come and be part of our family. There are a variety of groups available to you: Connect Groups, Sunday Morning Community Groups, and Interest Groups. These groups meet on Sundays and during the week, on-campus and off-campus, by interest or age and stage. Hear about the latest challenge to the pro-life movement in a presentation by Dan Becker, the former president of Georgia Right to Life, and the founder and president emeritus of the Personhood Alliance. Camp All-American (CAA) is in need of 25 host families to support our summer staff. If you live within 10 miles of Perimeter Church and have an available bedroom and bathroom from May 20 to August 2, please consider hosting one of our outstanding college students for the summer. Learn more about CAA at campallamerican.com. Join us for an evening of fellowship and fundraising at the scenic Bowen Farm. The evening will include an exclusive silent auction and viewing party of the nation’s top horse race. Don your favorite Derby attire and enjoy delicious southern cuisine and traditional Derby fare. Join Community Outreach in hosting an appreciation luncheon for the amazing faculty at Summerour Middle School. Serve lunch during teacher appreciation week to say “thank you” to the teachers for investing in the next generation. Join your friends for “There’s No Place Like Home: A Night For Our Neighbors” gala. Your ticket is a donation to the co-op and includes hors d'oeuvres and dinner. Attire is colorful casual. The Facilities department is seeking a housekeeping and set-up manager to ensure the facility is prepared to support all ministry functions and present a clean, organized, and safe environment. Strong leadership, time- and task-management, and detail-oriented skills are required. Perimeter Ballet's spring recital is a worshipful evening of uplifting music and dance featuring our students (ages 4 - high school). Admission is free. Please join us! Doors open at 6:30 PM. Perimeter School establishes life-long learners and kingdom builders through covenant education. We are accepting applications for students in grades kindergarten through 8th. To learn more, contact our admissions office at 678.405.2307 or visit our site. "The Holy Spirit will teach us how to pray" (John 14:26). Join us each week as we pray for the church and her ministries. Everyone is welcome! This is a great place for seasoned pray-ers and those just learning about prayer. Do you have the gift of supplication? Are you in need of prayer? Visit the Prayer Ministry's prayer wall to share prayer requests and pray for others. Submissions can be anonymous. If you have to miss, remember you can live stream the Sunday services at perimeter.org/live. On Sunday in the Main Sanctuary, Randy Pope will be the worship pastor. Collin Baxter, Cameron Bible, Laura Story Elvington, Michelle Swift, Ryan Van Kirk, and the choir will be the leading worship. You’re invited to the Ligonier Ministries Atlanta Conference: "What We Believe." Join Anthony Carter, H.B. Charles Jr., Dr. David Hall, and Burk Parsons as they consider six essential doctrines of the Christian faith that help us to know, articulate, and defend exactly what we believe. Former members Nick and Brenda Tea need housing for their college age son during the summer so he can stay and work. Please contact them if you have a room available in your home. 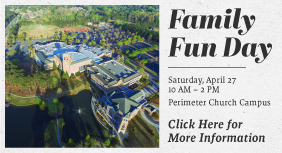 © 2019 Perimeter Church 9500 Medlock Bridge Rd, Johns Creek, GA 30097. p.678.405.2000 All Rights Reserved. The Perimeter Pulse is a free, weekly subscription-based e-mail newsletter of Perimeter Church in Johns Creek, Georgia.